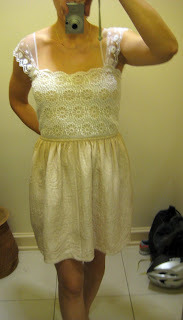 A very pretty dress ($890) that will look so much better on one of you. On me it looks like I'm breaking out my first communion duds. This cotton sweater I adore and would buy. 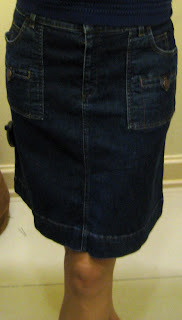 The denim skirt ($280) is very cute but I'm too cheap to spend Chloe prices on a denim skirt. 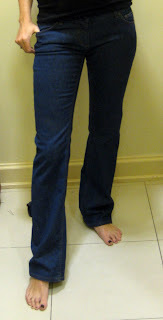 The jeans, however, yes, if I could, I would pay $295 for these jeans. Love. 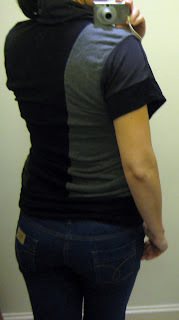 Love the length, love the back pocket. Love even the See by Chloe on the rear. Perhaps I can rationalize because these fit so well (although I could use a size up, biggest was a 28), and I believe it's easier to find cute, inexpensive denim skirts than cute, inexpensive jeans. Also, the Cavalli in the same section as the See by Chloe (2nd floor across from the BCBGeneration) is 60% off. I'm not normally big on Cavalli but the Just Cavalli blouses are worth a look. Other interesting Macy's sale items: Christopher Kon & Junior Drake bags are 30% off. Look for them on the main floor by the north Broadway entrance. Oh, that first dress is very romantic. Waaaah, you should be able to get those jeans! They look so good on you. Love the first dress too. I love Cavalli too....well, I guess it is more accurate to say that I love all the pics I've ever seen. It is hard to get great fitting jeans that's for sure. They are worth the money. Sister - i'm crying too, it's painful! lipstick - you'd love the cavalli blouses on sale at macys - come to new york! pru - they are, but sigh, I got no green! Anyone still owe you a Christmas gift? Maybe you could point them in the direction of THOSE JEANS. The sweater is darling. The 1st dress is *very* wafer-time. & gosh, those prices! that first top is so romantic & sweet! You've just put the booty in licious.